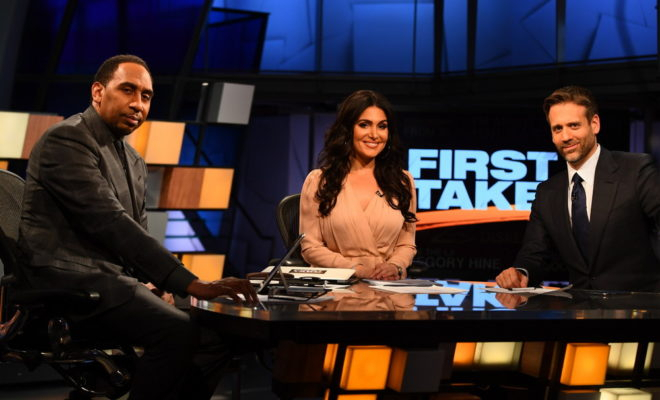 ESPN announced today that their show First Take will make a permanent move to the network’s New York Seaport District Studios on September 3rd. 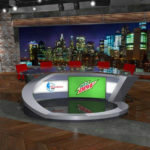 Starting on September 3rd, First Take will move from its current studio at ESPN headquarters in Bristol, Connecticut to the New York Seaport District Studios in New York City. ESPN announces that this will be a permanent move for the show. Molly Qerim will continue to host, and featured commentators Stephen A. Smith and Max Kellerman will also remain with the show. While filming will be conducted in New York, First Take‘s production will remain in Bristol, CT.
First Take airs weekdays from 10 am – Noon EDT on ESPN. SportsCenter anchor Linda Cohn has signed a deal to remain with ESPN for years to come. She’s been with the network for over 26 years and is the first SC anchor to record 5000 episodes. Alex Gibney produced show Enhanced debuted exclusively on ESPN+ on July 16th. The docuseries explores how science and technology plays a role in athletic training, sports recovery, and more. ESPN, Disney XD, and Blizzard Entertainment recently teamed up to offer exclusive coverage of the Overwatch League finals. Fans can tune into either or both networks to cheer for their favorite teams as the battle to win the grand prize—$1.4 million. During the fourth annual Sports Humanitarian Awards, ESPN announced a $100,000 grant would be awarded to the U.S. Center for SafeSport—a national nonprofit authorized by Congress—to focus on preventing all forms of abuse in sport.